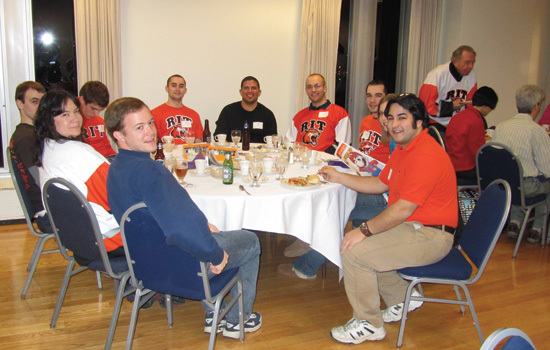 Alumni enjoy a pregame reception before the RIT vs. Holy Cross hockey game in Worcester, Mass., on Jan. 22. Recent activities: On Oct. 23, alumni and guests gathered at Pinhead Susan’s and the Messa Rink at the Achilles Center to cheer on the RIT men’s hockey team as they lost a tough game to Union College. Coming up: Plans are under way for an alumni event this summer. Please check the website for details. Recent Activities: Alumni gathered at The Melting Pot in Midtown Atlanta on Feb. 24. Recent activities: On Oct. 18, alumni gathered to prepare a global feast. Alumni were given instructions on how to cook a foreign cuisine (Caribbean, African, Mexican, Italian, Greek and Asian) at the kitchen of Whole Foods Culinary Center. Alumni enjoyed lunch at County Line Bar-B-Q and attended the University of Oklahoma vs. University of Texas basketball game on Jan. 15. Coming up: Plans are under way for an alumni event this fall. Please check the website for details. Recent activities: On Jan. 22, alumni gathered to cheer on the men’s hockey team as they took on Holy Cross in Worcester, Mass. Thanks to Steve Staurovsky ’08 and Tim George ’08 for hosting this event. Coming up: Alumni and friends are invited to enjoy an evening of great food and wine hosted by Ian Bennett ’05, owner of the Isaaks of Salem winery. Please check the website to register. Alumni also are invited to two Boston Red Sox games on May 7 and Aug. 4. Please check the website for details. Recent activities: In November, alumni and guests gathered at the University of Niagara for a pregame reception before the RIT vs. Niagara Division I Atlantic Hockey rivalry game. Alumni enjoyed pizza and wings while discussing RIT hockey and other events taking place on the RIT campus. Thank you to alumni host Tom Stumpf ’89. Coming up: Plans are under way for an alumni event this spring/summer. Please check the website for details. Recent activities: Last fall, alumni in the Central (Melbourne) and South Florida (Fort Lauderdale) chapters met at The Melting Pot in their respective regions. Coming up: Alumni and friends are invited to join RIT for a ROCS (Reaching Out for Community Service) Day at The Ronald McDonald House of Charlotte in April. Recent activities: On Dec. 2, alumni and guests gathered at Rock Bottom Brewery in downtown Chicago for a networking event with a brewery tour and brewing demonstration. Thanks to everyone who came out for this wonderful event. Coming up: Plans are under way for an alumni event in fall 2011. Please check the website for details. Recent activities: Alumni gathered at The Melting Pot in Lyndhurst, Ohio. The room was packed—and so were our bellies. Recent activities: Alumni in Denver gathered for a happy hour at the Brown Palace on Nov. 4 while alumni in Boulder gathered Nov. 5 at Boulder Chophouse. Alumni from all over Colorado gathered for an alumni dinner and hockey game as the RIT men’s hockey team took on Air Force Nov. 7 in Colorado Springs. Coming up: Alumni are invited to help out at Food Bank of the Rockies in May. Please check the website for details. Coming up: Plans are under way for an event this spring. Please check the website for details. Recent activities: On Oct. 30, alumni gathered to watch the Dallas Stars take on the Buffalo Sabres. Thanks to alumni host Scott Saldinger ’91. Coming up: In April, we are planning a tour of Dallas Cowboys Stadium followed by lunch. On June 11, we’ll be sailing on Lake Lewisville. Go to www.rit.edu/alumni/dfw for details. Recent activities: On Dec. 6, alumni and guests gathered at Joe Louis Arena in downtown Detroit for a night of NHL hockey as the Detroit Red Wings hosted the San Jose Sharks. Coming up: Plans are under way for alumni events in the near future. Please check the website for details. Recent activities: On Feb. 2, alumni gathered at PINZ bowling alley to enjoy a game of friendly competition and fun as they bowled the night away. Recent activities: Alumni and friends enjoyed a spectacular night of wine and appetizers at City Winery on Feb. 22. Coming up: Phillies vs. Florida Mariners on Aug. 26. Register at www.rit.edu/alumni/philly. Recent activities: On Dec. 30, alumni, students and parents gathered at Café Fifth Avenue for a Tailgate and then walked across the street to the new Consol Energy Center to watch as the men’s hockey team took on Robert Morris University. Special thanks to alumni host Al Mature ’74. Coming up: A cooking class will take place this fall. Please go to www.rit.edu/alumni/pittsburgh for details. Recent activities: On March 1, alumni enjoyed a Carolina Hurricanes game as they took on the Florida Panthers. Coming up: You are invited to a tour of Aviator Brewing Co. April 23 with a reception directly following. Please check the website for details. Recent activities: Alumni enjoyed a holiday hors d’oeuvres cooking class at the New York Wine & Culinary Center on Dec. 7. Alumni enjoyed discount tickets to RBTL’s production of In the Heights at Auditorium Theatre on Jan. 28. Alumni and friends watched the men’s hockey team battle Mercyhurst during Tiger Sports Night on Jan. 29. Special thanks to our alumni volunteers Bary Siegel ’66, ’68, ’75, ’90 and Donna Bell ’83. A sold-out group of more than 200 alumni and their families enjoyed the third annual father-daughter dance on Feb. 12. Special thanks to all of our volunteers. A group of snow-loving alumni and guests enjoyed a day at Hunt Hollow ski club on Feb. 19. Thanks to alumni host Frank Lucas ’75. Alumni and guests enjoyed an evening at The Little Theatre on Feb. 28. Special thanks to our alumni hosts Terry Palis ’77 and Alina Palis ’79. A group of alumni and guests enjoyed an afternoon at the Rochester Curling Club on March 13. Thanks to alumni hosts Terry Palis ’77 and Shirley Murphy ’81 ’95. Alumni enjoyed discount tickets to RBTL’s production of Disney’s The Lion King at Auditorium Theatre on March 24. Coming up: Registration is now open for the following events. To register, go to www.rit.edu/alumni/rochester. Recent activities: Alumni enjoyed a beautiful afternoon of whale watching on Jan. 29. Special thanks to Phil Ohme ’99 for hosting this event. Coming up: Plans are under way for an alumni event this spring. Please check the website for details. Coming up: You are invited to join RIT as we tour Red Hook Brewery then gather for dinner this spring. Thanks to hosts Mike and Lisa Woods ’92, ’93. Alumni and friends are also invited to join us for a Seattle Sounders game this summer. Please check the website for more details and to register. Coming up: This summer we will be gathering to attend a reception around the New York Jets training camp in Cortland. Please check the website for details. Recent activities: Alumni and friends gathered on Jan. 15 for a pregame brunch and Syracuse University men’s basketball game as the Orange took on the Bearcats. Coming up: You are invited to join RIT on our second annual cruise on Skaneateles Lake June 25. Please check the website for more details and to register. Coming up: Alumni enjoyed a pregame dinner at the Chesterfield before going to a RIT men’s basketball game on Feb. 18 as they faced Utica College. 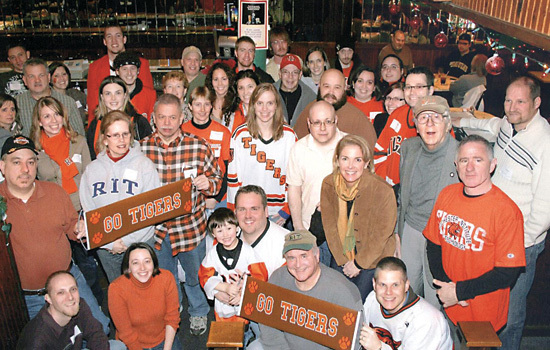 Recent activities: Alumni gathered to watch the RIT men’s hockey team take on Mercyhurst Jan. 29 at Lounge 201. Thanks to the RIT Alumni Association Board of Directors for hosting. Alumni and friends enjoyed a food and beer pairing event at Vintage 50 on Feb 26. Special thanks to Kevin Sheldon ’02 for hosting this event. Coming up: You are invited to join RIT for a private reception and day at the Newseum, a museum dedicated to news, this April. RIT alumni have a special opportunity to see D.C. by kayak as we tour the Potomac for a sunset tour this June. Please check the website for more details and to register. Recent activities: On Oct. 23, alumni gathered at Ganondagan State Historic Site for an educational tour and a hearty lunch. On Oct. 30, alumni enjoyed a wonderful fall afternoon at Long Acres Farms and lunch at the grill. Nov. 1 kicked off Native American Month. There were several events that took place that week—from keynote speaker Peter Jemison (former Minett Professor) to the film Unseen Tears to a traditional Native American Thanksgiving dinner. This was offered through the Office of Diversity and Inclusion. On Nov. 20, Wegmans Culinary Kids: Hands-on-Cooking Classes were held in three sessions for children ages 3-16 at the Pittsford location. This class will be offered again in early April. On Feb. 4, RIT welcomed Grammy-award winner Smokie Norful for a concert at Clark Gymnasium. Coming up: Preparations are under way for a Black Awareness Coordinating Committee (BACC) Alumni/Black Alumni Ball on May 7. If you were a member of BACC, please call Candi Boston at 585-475-4279 to make sure you are on the mailing list. Recent Activities: Alumni in Bangkok, Thailand, enjoyed dinner at the Landmark Hotel on Sept. 22. Special thanks to local alumnus Mark Fisher ’89 and Sonja Phongsavanh from RIT’s graduate enrollment office for hosting. Alumni in Malaysia joined Richard Doolittle, assistant provost for undergraduate education, for dinner at Summer’s Palace in Putrajaya. Special thanks to local alumni Nur Adilah ’10 and Nurul Hawa ’10 for hosting the event. Alumni in Hong Kong joined RIT professor Stephen Jacobs for dinner at Di King Heen on Dec. 1. Coming up: The Office of Alumni Relations is currently planning events in Turkey, China, and India. If you are interested in becoming a chapter volunteer or planning an alumni event in your city, please contact Jon Rodibaugh at jonathan.rodibaugh@rit.edu.